The United States military is heterogeneous entity consisting of the Army, Navy, Marines, Air Force, and Coast Guard. The ongoing war in Iraq and the recent end of the war in Afghanistan has affected many military families, particularly children of military personnel. 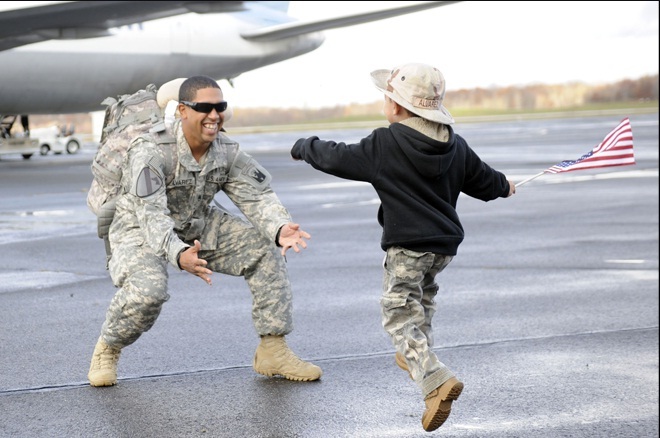 As of Noveber 2012, nearly 2 million children have a parent serving in the military. 40,000 of these families have two parents in active duty and there are 153,669 single parents serving in the military (1). Children of military families face unique academic, social, and behavioral challenges as well as two important sources of stress; relocation and deployment. One-third of all military families relocate annually. Stressors of relocation include adjustments to a new living and school environment. While the military base environment provides some stability to children, institutional barriers, such as not being able to participate in extracurricular or delayed graduation, can lead distress (2). Furthermore, not all families choose to or can live on base, and living in a new location may be particularly isolating for these families. Most of all, children of military may feel lack of control their own lives because they play no role in the decision to move (3). Although relocation is an attempt to maintain the family unit, it must be recognized that it is still a stressful situation for all involved. Deployment is defined as a period of time a member is actively serving in a combat or noncombat zone. During parental deployment, children are particularly vulnerable to stress and often exhibit internalizing (depression, anxiety, etc.) and externalizing behaviors (aggressiveness, combativeness with caretaker, etc.) (4). As a result, declines in academic performance and poor sleep are common. Less common, but very worrisome is the fact that children are at increased risk for maltreatment, particularly neglect (5) during parental deployment. Despite these worrisome behaviors, children are less likely to receive health care during parental deployment (4). Often this is a result of changes in family dynamics: the non-deployed parent acting as the sole caretaker or extended family members taking the role of primary caretaker. This can in turn lead to lack of health resource utilization and stressed coping mechanisms. Reunion with the deployed family member can also lead to difficulties in reestablishing relationships due to readjustment of family member roles as well as the withdrawal behaviors characteristic of posttraumatic stress disorder which may be present in the returning service member. Because of the above concerns, it is crucial for the health care provider to inquire about the effect of military life on their patients. Furthermore, providing anticipatory guidance regarding the possible emotions and maladaptive behaviors in military children can be helpful for families to be aware of and address if they occur. In adolescents, issues such as depression, eating disorders, and self-injury should be explored as well. Screening measures such as the Pediatric Symptom Checklist (7) can also be employed. Similarly, the emotional needs of the non-military or non-deployed parent or other adult care takers must be acknowledged and supported as well. Last but not least, the importance of providing military families with resources for help is critical. This can range from information and referrals to therapy and mental health resources, to local and online resources for military families in similar positions. Website maintained by the Department of Defense with a variety of resources and ways to connect with others. Student Online Achievement Resources (SOAR), is a free program for military families designed to encourage parents to play an active role in their children's education. After an assessment aligned to state standards, SOAR directs students to individualized tutorials & resources to improve and allows parents to monitor their progress from anywhere. American Academy of Pediatrics (AAP) Youth Deployment Support Website, designed to support military youth, families, and the youth serving professionals caring for this unique population. Lamberg, Lynne. "When Military Parents Are Sent to War, Children Left. "Jama 292.13 (2004): 1541-1542. Drummet, Amy Reinkober, Marilyn Coleman, and Susan Cable. "Military Families Under Stress: Implications for Family Life Education*." Family Relations 52.3 (2004): 279-287. Gorman, Gregory H., Matilda Eide, and Elizabeth Hisle-Gorman. "Wartime military deployment and increased pediatric mental and behavioral health complaints." Pediatrics 126.6 (2010): 1058-1066. Gibbs, Deborah A., et al. "Child maltreatment in enlisted soldiers' families during combat-related deployments." JAMA: The Journal of the American Medical Association 298.5 (2007): 528-535. Davis, Beth Ellen. "Parental wartime deployment and the use of mental health services among young military children." Pediatrics (2010).